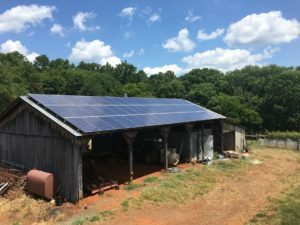 We’ve talked a lot lately about big solar plans by Virginia utilities and energy providers, and some of those big Amazon projects that are adding tons of capacity to Virginia’s solar network, but there are also other very different efforts going on in other parts of the state to help smaller solar systems contribute to the network that brings green, renewable power into the state. This past summer, the Progress Index reported on a farmer’s forum in Dinwiddie near Richmond, Virginia, in a rural area where local farmers grow crops like tobacco, wheat, corn and soybeans. You see a lot of these idyllic fields as you travel from north, south or west towards some of Virginia’s beaches and recreation areas on the coast. What you may not notice is that more of these farmers are being served with solar energy. The Progress Index report shows how farmers are considering building-mounted or ground-mounted solar systems to profit from sustainable energy, and quotes Goochland Cooperative Extension representative Bob Whitehead as saying that farmers have “lots of ways” to use solar energy. In addition to providing power for tractors and field vehicles, some of these local agricultural agencies are also recommending other types of systems, for example, solar-powered aquaponics and other innovative projects that help producers bring various types of food to market. Meetings like this one which was held by Virginia Corporate Extension and funded by the Virginia Tobacco Commission are promising ways to attract farmers to what more and more small business owners and property owners are realizing — that by installing new affordable solar systems, they’re positioning themselves for the future, and able to reap the rewards year after year. Solar customers can source their own power, and even contribute some back to the local energy grid with available net metering systems from utilities like Dominion and Appalachian Power. You don’t have to be a farmer to get in on the ground floor of Virginia’s solar revolution — talk to Sun Day Solar about any type of custom solar plan to equip your property or business with what it needs to harness the natural power of the sun. We help our customers to find practical ways to implement renewable energy production that will leave the earth in a better condition for our children and grandchildren — to really do our part to help protect the planet for the long haul.